Amino Magnetic Beads are superparamagnetic beads with rich amino groups on the surface thus can bind to polypeptides, antibodies and other proteins, oligonucleotides and certain chemical compounds with certain chemical reagent (such as glutaraldehyde). 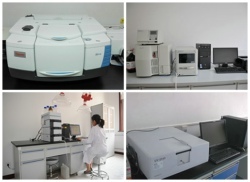 Amino magnetic nanoparticles are widely used as an important carrier of the medical and molecular biology research tools. Our amino magnetic beads are with higher magnetic response, lower nonspecific adsorption and richer binding sites with activated groups of amino on the surface, which can easily and efficiently combine with a variety of ligands such as protein, polypeptide, oligomeric nucleotide and drug molecules, especially for batch isolation and purification. Amino functionalized magnetic silica beads have the same structure as silica coated magnetic beads. It is also with typical core shell structure. The core is superparamagnetic Fe3O4 nanospheres which is coated with silica layer as shell. Amino groups are from surface modification by KH550. Besides amino groups, there are still some –SiOH groups left on the surface. Therefore, amino functionalized magnetic silica beads are not suitable for separation and purification of protein as well as other biomacromolecule. The structure of amino treated magnetic polystyrene microspheres is typically sandwich type. The inner core is monodisperse polymer microspheres. Magnetic oxide layer is in the middle between uniform polymer microspheres and the outermost layer which is hydrophilic and hydroxyl functionalized polymer layer. By amination, hydroxyl groups convert to amino groups. Through cross-linking reagents (such as glutaraldehyde, etc. 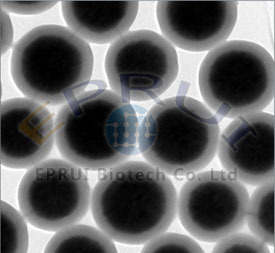 ), amino treated magnetic polystyrene microspheres are able to covalently coupled with protein ligands (such as antigen, antibody, etc. ), oligonucleotide probes and other biomolecules on the surface,which makes amino treated magnetic polystyrene microspheres an important carrier in medical and molecular biology research.